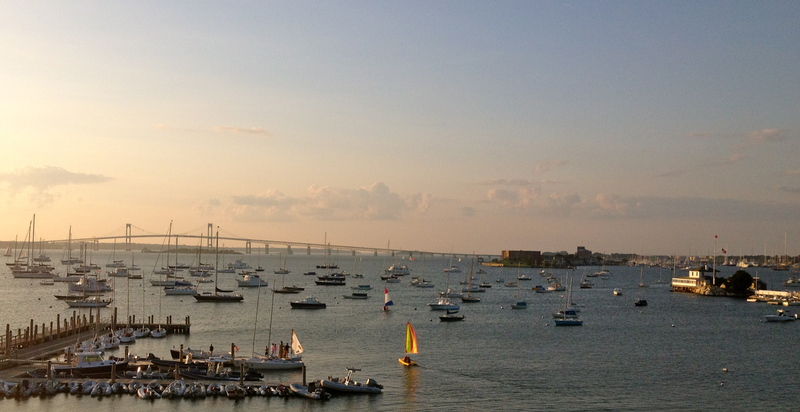 The Newport Bridge, off in the distance, on a late summer evening. Somewhere in the sky between Rhode Island and Florida, I’m finally getting around to writing this first blog post. It seems an inauspicious beginning, at least in my present state of mind. I am doing my best not to allow abstract and perhaps overly ambitious notions of what I imagine this blog will become overwhelm even the most uncertain attempt at a start, but it’s proving to be more difficult than it probably should. I keep self-consciously adjusting my laptop’s screen, hoping to find some angle that will make it impossible for any neighbor to inadvertently read over my shoulder, as I tend to do with an unavoidable curiosity whenever words are presented just out of my reach. Yesterday, I ran over the Pell Bridge, from Jamestown to downtown Newport, a total distance of 4.2-ish miles according to my watch, and 4 miles according to more official sources (my inability to remember to stop my watch at the end of a run, and particularly at the finish of a race, means that my total distances and times are always slightly suspect). Today I am sore all over, which is surprising; I can’t remember the last time a run of any distance made even my abs hate me the next day, but apparently running over a big bridge in weather much colder than you’re used to will do that. But despite this, the run went well. I finished in 34:37, which doesn’t correlate to my best 5k pace but was better than I had expected. It was the first time I’ve run in about a month, since I did a casual 5k over a mid-October weekend, regretfully but wisely forsaking my plans for the half-marathon. Since August, I’ve had some trouble with my right heel and arch area; it is a pain that is difficult for me to really pin down, but hopefully not tendonitis or anything too serious. It hasn’t been enough to make me unable to run, but I’ve been cautious this fall nonetheless. I had registered for the Miami marathon last year, but a bad groin pull (very high, quite embarrassing) in the preceding spring kept me from running for almost half a year. By marathon time, I was barely back up to twenty miles a week, so my registration fee and fantastic three-digit bib number were offered up as virginal sacrifices to the road race deities. I am determined to make it to the starting line of this year’s marathon if I have to drag my poor self held together with sports tape and Icy Hot patches, so I’ve forced myself to give my foot a chance to heal these last few months. But enough is enough; now it’s November, and so training calls. My foot didn’t hurt at all while running yesterday. I can sense some tightness today, but not the sharper pain I had been experiencing before I took these few weeks off. By chance, or the affinity Newport locals have for well-stocked beer taps, I was able to get some free advice from a physical therapist I chatted with at my favorite bar, which I’ve gratefully taken to heart, as he wasn’t completely skeptical of my chances (and who am I to scoff at free professional advice, with my just-sufficient graduate student health insurance?). I’ve been spinning two to three times a week, doing Bar Method classes at least three times a week to increase my strength and flexibility, and taking long daily walks around South Beach with my dog, Finn. I was surprised to find that running the race — up, over, and down all 11,248 feet of the Newport bridge — was easier than I had expected. My intense, studio-style spinning classes have clearly helped to keep my general fitness and endurance at a reasonable enough level, so that I should be able to get back to urging my body into marathon-shape without too much resistance, as long as I don’t aggravate this foot of mine again. This week I’m signed up for another three spinning classes, and will try to get at least three Bar classes done, and I’ll aim to work in a few easy three milers. Hopefully, it will all go well, and without too much complaint from this stubborn injury. So why am I writing all of this? What prompts me to share my not terribly interesting stories of running with whoever may bother to stumble upon this page, in whatever corner of the internet it exists? And what, my hapless reader may also wonder, prompts me to do something so fundamentally crazy as attempt to run a marathon in the first place? While fitness and athleticism are essential to my own health and sanity, I don’t believe that I should be held as any kind of paragon of ideal being, and have no intention of turning this blog into a kind of platform to brag about my own accomplishments or suggest that everyone else should be like me. I believe strongly that individual happiness is just that — individual — and so what works for one person should not be imposed indiscriminately on anyone else. I haven’t eaten meat since I was fourteen, though I occasionally eat fish when I need some extra protein; this diet works for me, but I wouldn’t suggest that therefore everyone else should follow it too. I think it’s important to do what you need to do to be physically and psychologically healthy, not to conform to social expectations of body perfection and success or anything, but to honor your self and your body in whatever way makes you happiest. I first thought of starting this blog as I began to connect running — how I run, what running is to me, as both a physical and psychological exercise — with writing, and the processes and pitfalls I encounter with both. Running is not just a question of staying in shape for me, or of feeding some restless competitive desire, although these are both benefits I’m happy to accept. Running keeps me balanced mentally; when I don’t run, I am more prone to relapses of depression and insomnia, a cycle that is incredibly difficult to break out of. If I don’t exhaust myself physically just about every day, I have a hard time getting my brain to quiet down when I’ve finally crawled into bed, no matter how tired I may feel from whatever else I do during the day. Running is also incredibly challenging for me, despite a degree of natural athleticism that I’m lucky enough to have, thanks to the organized chaos of genetic inheritance. Writing, while quite different as a physical act, is much the same in terms of the challenge it presents me with, always, despite my natural inclination for it. Just as I have to convince myself, most days, to get out of bed and into my Sauconys with a substantial amount of self-coercion, writing is something I always have to push myself to come to — or drag myself to, perhaps — regardless of the sometimes overwhelming amount of ideas that occupy my mind and distract me from the more practical concerns of life, like remembering to check my email and change up my contacts at least once a month. The clichéd explanation would be that both running and writing often feel more like pulling out my own teeth than any kind of effortless outpouring of intellectual or athletic genius. But perhaps I wouldn’t care so much about either, if they weren’t such a constant challenge. Writing a blog about my running seems, then, the natural thing to do to tangibly link together these two very different yet complimentary aspects of my life. Hopefully both will encourage the proliferation and success of the other, or at least keep me honest in the attempt. And training for a marathon at this point in my life seems particularly appropriate, given that I am currently reading for the qualifying exams for my Ph.D in English Literature. This means that when I’m not running, spinning, barre-classing, or dog-romping, I’m probably sitting on my sofa reading 18th and 19th century British novels, deciphering (hopefully) theories of gender and politics, and attempting to begin the somewhat-intimidating task of constructing a coherent dissertation proposal. The similarities between marathon training and exam reading are, for me, quite obvious and quite humbling. Both require that I reform my tendency for last-minute preparation; I can read a 500-page novel relatively quickly, if I must, and can tackle a 5k in decent enough time without too much specific preparation. Three lists of thirty or so texts each, with more than a few novels reaching the heights of the five to eight-hundred page triple-decker door stop, are not so easy to ignore, and I don’t have the hubris to imagine myself capable of finishing 26.2 miles without being very faithful to a decent training plan. With the unabridged Clarissa sitting on my coffee table, smirking at me as I willfully ignore a stack of freshman papers waiting to be graded in favor of watching yet another old episode of Law and Order: SVU (but it engages with issues of gender and sexuality in a popular episodic genre form, so it is something like a contemporary version of your Victorian serial mystery, isn’t it? Perhaps?! ), and my ever-increasing pile of running shoes waiting by my apartment door, I know I have my work cut out for me for the next few months. Because just as I know my 18th century Richardson-loving professor will be asking me something about those 1,534 pages of epistolary narrative, I can be certain that somewhere between Midtown Miami and Coconut Grove I will be feeling like some horrible reincarnation of Sisyphus, trudging my way towards the next mirage of a water station, and the only way I’ll be able to convince myself to keep going will be in the knowledge, however tenuous, that I’ve come prepared for the challenge. This entry was posted in First Post, Rest Day and tagged Marathon, Newport, Newport Bridge, Pell Bridge Run, Rhode Island, Writing on November 12, 2013 by libbygates.